Some online slots like to mix up a couple of genres and that’s the case with this fruit machine-style game from Microgaming. It’s called Treasure Ireland and the two themes it merges are of course pirates and the Emerald Isle. Treasure Island is a three reel and one payline slot set against a nautical backdrop; a galleon fills up most of the screen and the symbols are a mixture of Irish and pirate icons. They include shamrocks, skulls and crossbones, pints of Guinness, parrots, a treasure chest and the ginger-haired captain himself. The captain is the most valuable symbols and is worth 500x your stake for three on the payline. You will notice that some of the symbol have a small treasure map attached to them; if you can land three of these anywhere in view you will kick off this bonus game. It’s similar to the feature in games such as Apocalypse Cow and you get to play a board game by spinning the counter in the centre and moving around the squares. You will land on options that include multipliers, cash wins or features and you can collect when you want to. You will also find that you land on the question mark squares a disproportionate number of times and this usually results in heading back to the base game with nothing to show. A bonus square will help you out with random offerings; for example collect three potatoes for an extra life. See it in action in the video below. 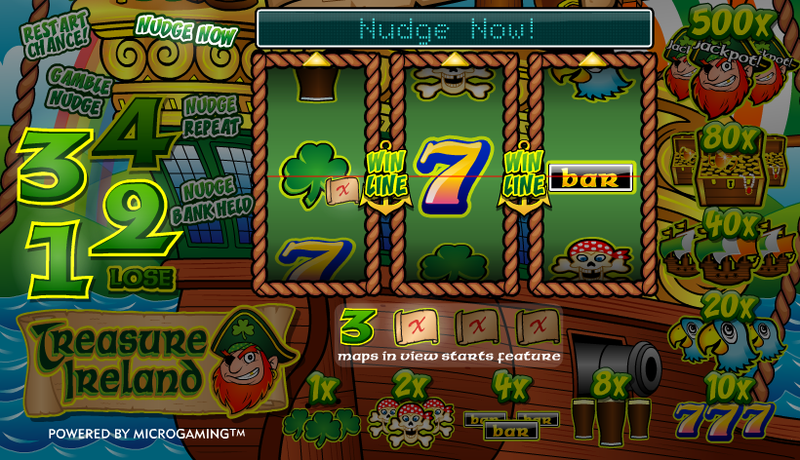 Nudges are randomly awarded and let the player nudge down reels to try and make winning combos or collect treasure maps. Holds are also randomly awarded and allow the player to freeze certain reels to try and achieve the same aim. The reels will rearrange themselves into a guaranteed win when you see ‘Shifta’ written in the noticeboard. Look out for this in the noticeboard and when you see it, dob’t be tempted to use the holds – just click spin for a guaranteed win. The aim of the game is to trigger the feature so use the nudges and holds offered to that effect. When you actually make it there, don’t try and progress too far because you’ll land on a question mark soon enough and the game will be over. Collect as soon as you can. The difficulty of winning in the feature means this isn’t quite as enjoyable as some of Microgaming’s UK-style games but it does grow on you the longer you play. Worth a go.